..regal air of feline royalty. The more time spent with an animal, whether it is a horse, dog or cat, the more nuances, details and characteristics emerge. By paying attention to those nuances our relationships with them grow exponentially as the connection strengthens. My cat, Essie, was a young stray when I took her into my home. Initially she was Mom’s cat but with Mom’s passing the cat has become my muse, my “familiar”. She serves no purpose really other than to be a living, loving ornamental figurine that eats stinky food, leaves her white/beige fur in clumps around the house, and deposits litter box droppings that smell worse than a home-grown Meth lab. We have grown together over the years like an old married couple, dependable, on a set time schedule, unhappy with any disruptions or interruptions. Each day our communication improves as I gain her trust. There’s the usual, “Don’t touch me there”, irritated meow, the “Damn dog”, indignant meow and the pitiful, “Feed me” meow. Now she’s allowing me to stroke one finger against her whiskers, her closed-eyed look of bliss my reward. But this may only happen when she deems the moment appropriate, it’s not something I can initiate. I treasure those moments when she lets me close, when she drops the veneer of aloofness and regal air of feline royalty. She keeps me (and the dogs) on schedule at night. She herds the three Border Collies and I to the bedroom early each evening. But in the early dawn light she sleeps in, letting the dogs with their cold noses get me out of bed. Their insistent whines and barks are much more effective than Essie’s hypnotic purring. Like the Cheshire Cat Essie appears around the house in unusual places, sometimes scaring me. It’s like she saw a place she’d never been before and quietly jumps there, resting until I enter the room. Does she delight in seeing me jump in fear? Is she snickering? In the afternoon if I’m on my computer Essie and one or all of the dogs will sleep together on the bed. The dogs have been trained by Essie not to roll, walk on or upset her when she is sleeping. Lately though Tommie has become indignant at Essie’s hoity-toity attitude. Tommie growls softly and jumps off the bed as if to say, “Damn cat”. I trust my dogs would not hurt Essie. 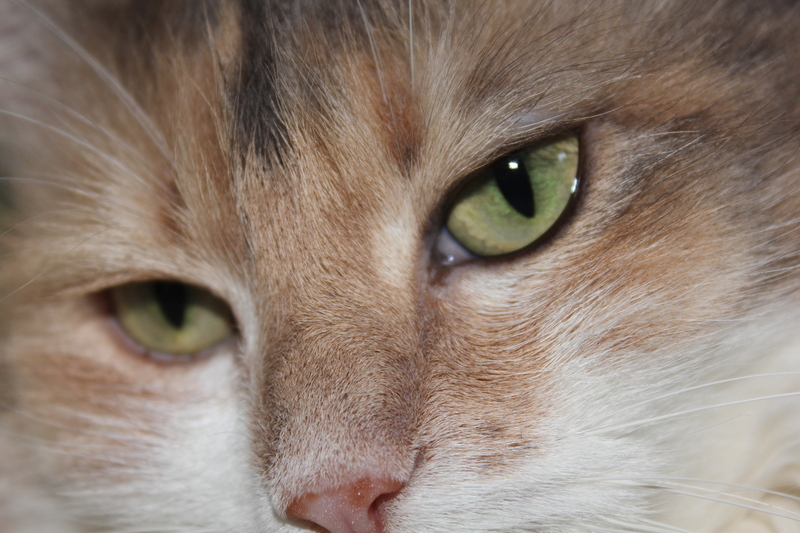 They have experienced Essie’s evil side: a glaring look, a hiss or one swat on their tender snouts has been enough to convert them to the adage that “cat’s rule, dog’s drool” is a mantra, not merely a joke from a movie. Essie wags her tail like an upset lioness, her initial warning system to back off but it can also mean that we (the dogs and I) should leave the room, leave her alone, don’t touch her; don’t breathe on her, in one word-leave. Essie is a bit of a snoop too, using her claws to open unlatched closet doors, sniffing through the contents and perhaps taking a nap. A time or two she has come up missing so I’ve had to open all the closet doors, the pantry door, look under furniture. Sometimes it seems like she has entered the Twilight Zone, since I can’t find her and have to wait for her to appear on her own. Alas, her one dream is to be an outdoor cat, a mighty hunter, to run freely in the backyard. Once in a while she stands by the back door and meows loudly enough to cause an echo in the laundry room. The most I’ll do is hold her in my arms while we step outside on the deck in the sun, the warm air blowing across her heavy coat. Life is too dangerous here for her to run outside, I believe, and yet I feel guilty. The plethora of fox, hawks, traffic and neighborhood dogs present a clear and present danger, a danger manageable with my dogs that follow me obediently. Not so with a cat who is free willed and independent and almost died in the woods years ago after being attacked by an unknown wild animal. There are more elements of Essie that will be revealed to me over time. Animals are multi-layered individuals, different species who speak without our words but say so much with their eyes, a tongue lick, whinny or bark or in Essie’s case, a purr. Lucky is the person who is owned by a cat. This entry was posted in border collies, Cats, Dogs, Retirement Life and tagged Border Collies, Cat, Cats, Pets, retired life. Bookmark the permalink.